P.D. Platt is an independent author with a range of published fictional works. He enjoys the never-ending pursuit of immersive storytelling, focusing on human struggles of survival against nature, man, and the inner self. His preferred platform is the novella, which he believes offers the purest form of fiction, pulling the reader into a temporary world and leaving them with an appreciation for life and the human spirit. Raymond leads a happy, normal life. He has a successful career in a commercial building supply company, a marriage of 12 years to Gwendolyn, and has a great father-son relationship with his 11-year-old son, Justin, who loves to make airplane and rocket models. When unexpected and damaging circumstances occur, Raymond contemplates two pivotal choices; to put himself out of his misery or turn over a new leaf. It is easy to relate to Autumn Choice by P.D. Platt. When a great life turns bad, one could keep fighting or give up. Raymond is a model citizen. An avid motorcyclist who rides to work, he’s a “simple man, a homebody”, likable by his colleagues, a good husband, and a good father. So when his marriage, his relationship with his son, his career, and ultimately his health take a nosedive, it’s understandable when he arrives at a life-changing decision. It’s as if the man is ridiculously punished for being good. Through the clear prose and succinct narrative, Platt reflects on the hardships of life, death, and the healing process. “Sometimes the embattled human mind needs a change even if ever so briefly to catch a glimpse of an alternate direction; a pause of sorts to allow even the faintest glimpse or inkling of hope.” All in all, Platt's Autumn Choice is a beautiful and realistic story that deftly tackles a heavy subject matter. 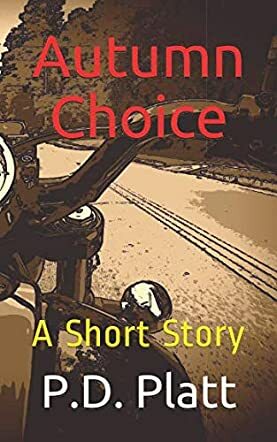 It is a substantial and reflective short read about decisions that people make when the going gets tough.